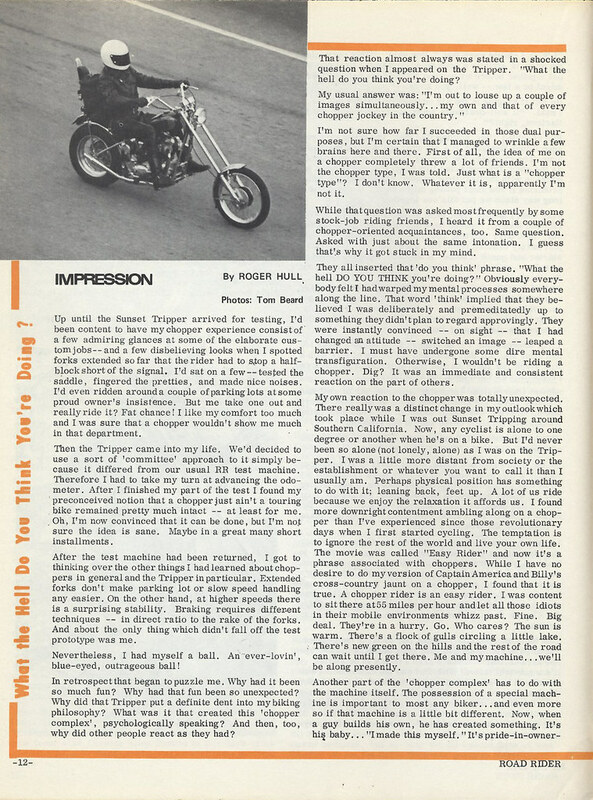 Nineteen seventy-two was the year Road Rider magazine decided to piss off its readers--dedicated touring motorcyclists all--by running a 12-page feature in their March issue on one of the first "production" choppers of that era. 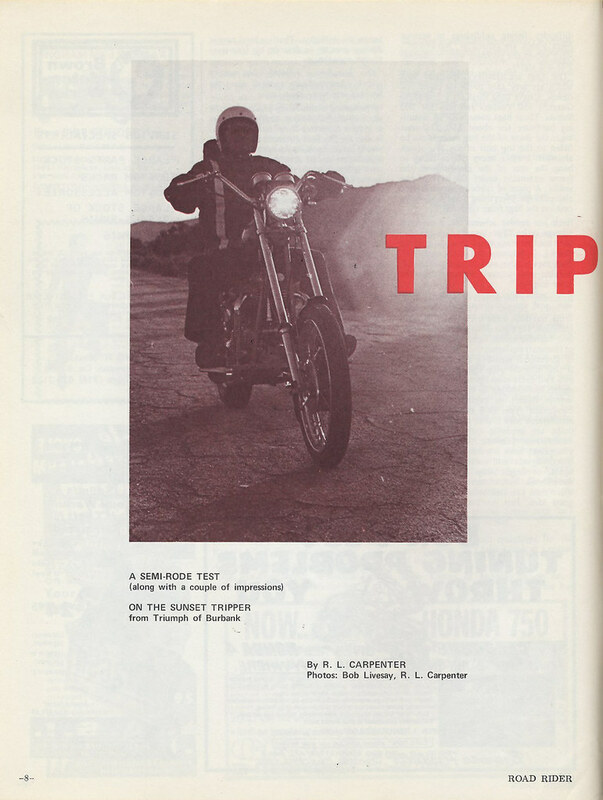 The Sunset Tripper was constructed by Triumph of Burbank, CA, from a brand-new Bonneville, and was featured on the cover of that now defunct touring magazine. This is their story. 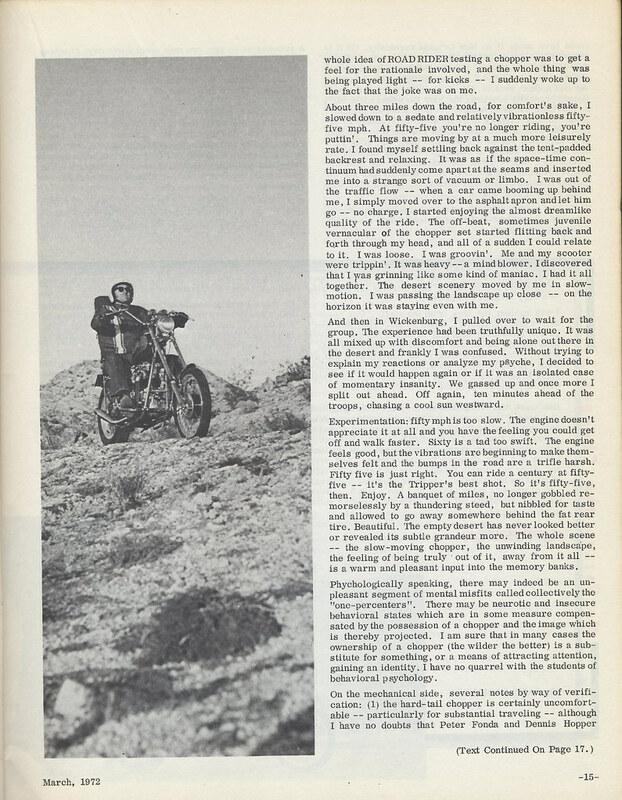 There are plenty of blogs that do a great job of recycling old magazine content, so we don't plan on taking ChopCult in that direction. 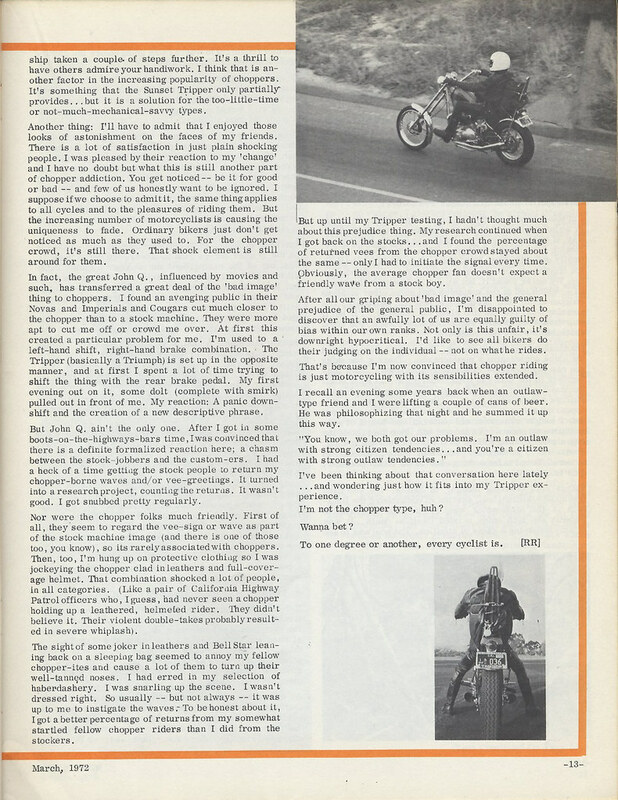 However, we think today's chopper jockey will find this story interesting because the original writer's experience could have happened 38 years ago, or last weekend. 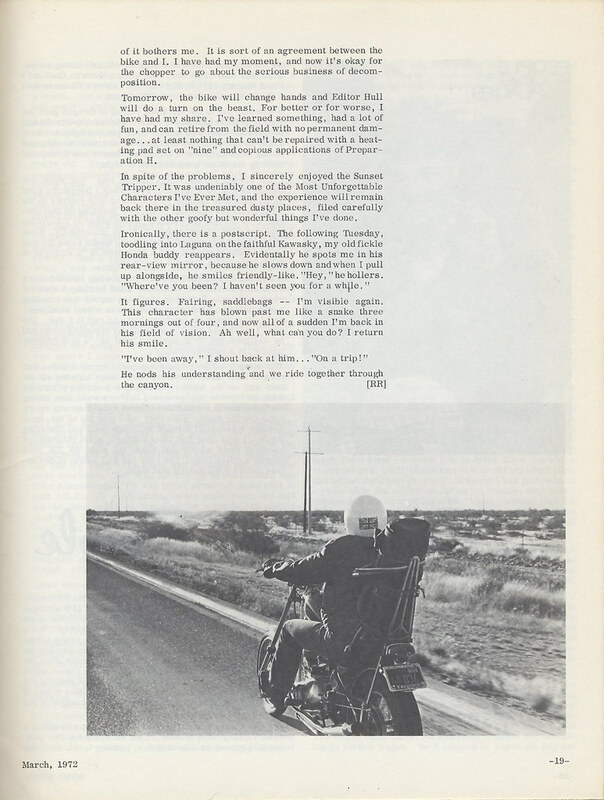 Produced in the day when magazines were a hand-crafted affair and 68-page books like RR listed 21 souls on the masthead (including a "Camping Editor! 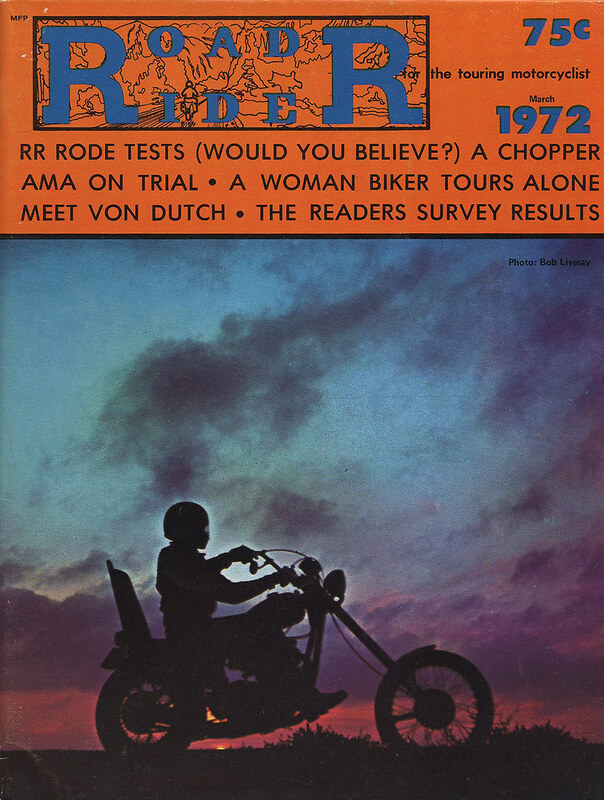 ), this was an in-depth look into the chopper phenomenon at the apex of it's social trajectory. It's a long read, but in the era of blogs, tweets, pokes and 2-second soundbites, we think it's worth the effort. 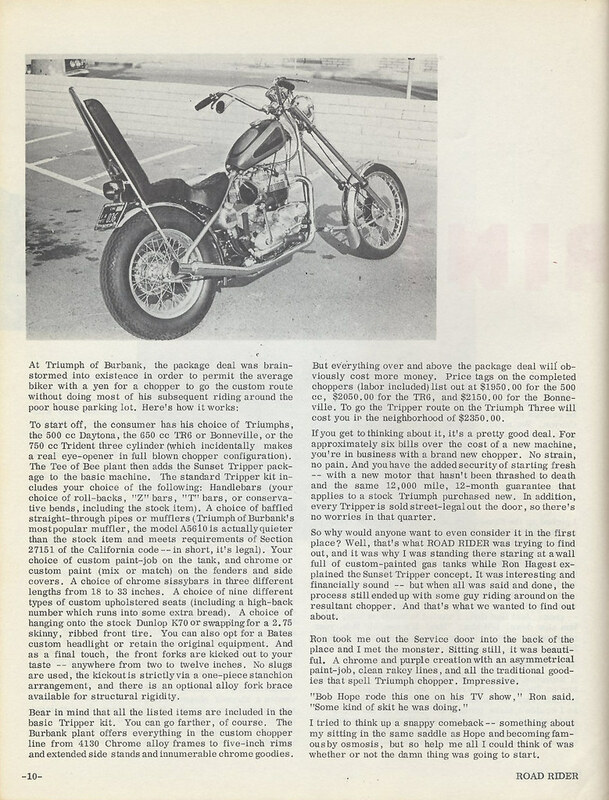 Ironically, one of our first feature bikes on Chop Cult was our friend Chris' Survivor, and original Triumph of Burbank chop. Nice long article! Too bad I cant sit still long enough to read it all!!! It is soooooooo cliche, but "if I had to explain, you wouldn't understand." there are alot of guys, then and now that just don't get it. I am not sure I actually get it, but I do feel it. 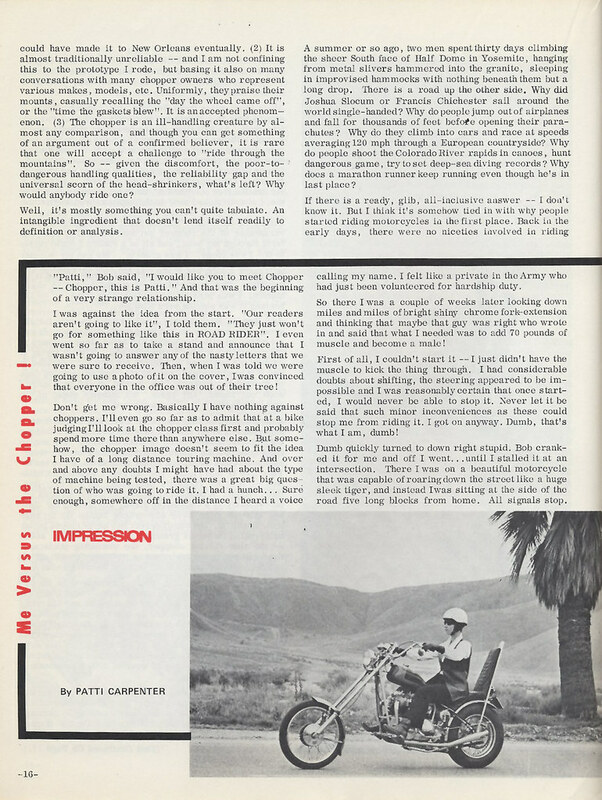 You need to do the "Meet Von Dutch" article from that issue, too. Ha! I was thinking the same thing Rich. very cool! I'm building a 72 OIF Bonneville right now...although it's not going that direction. 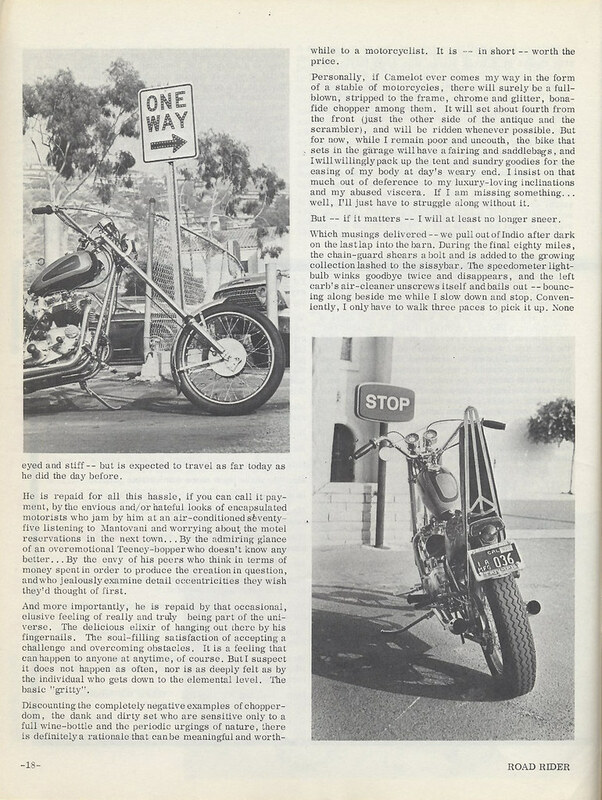 That sissy bar is quite the "Peace"...rimshot! damn that's a lot of reading.... For later I think. am i not seeing page 15? You are crazy Scott, it's been there the whole time. great gave me the same feeling I get when I smell play-dough.....all warm with that great rush to the past! Great piece. 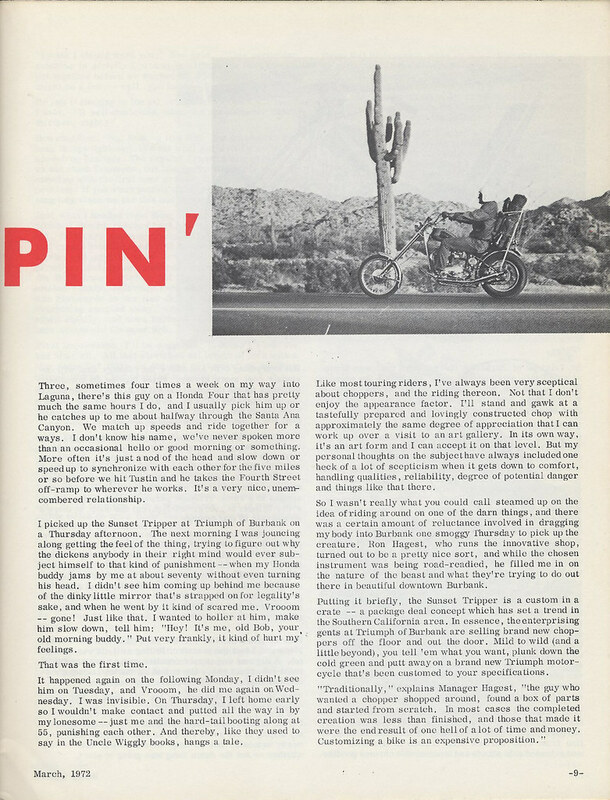 I agree about not recycling old mag content, but the I gotta see the Von Dutch article! 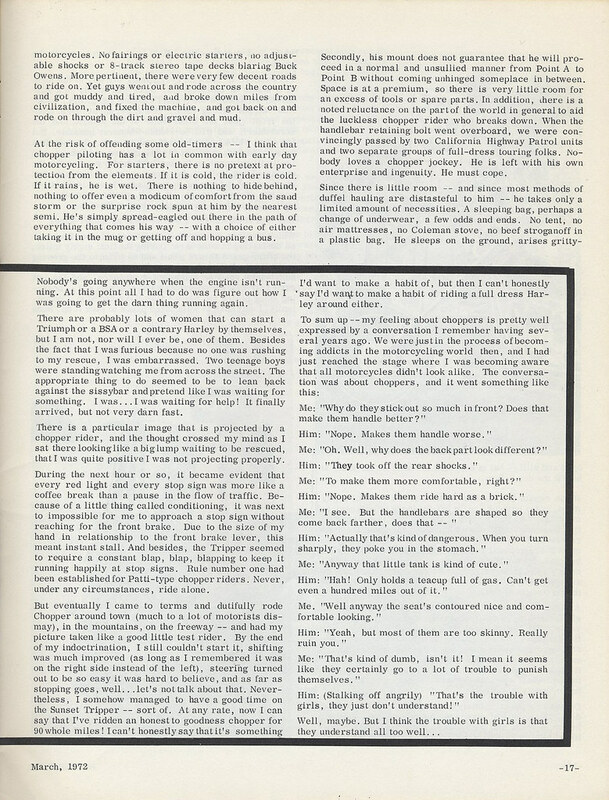 Great writing, if some of the terminology (slang) were different, it could have been read as a recent article. 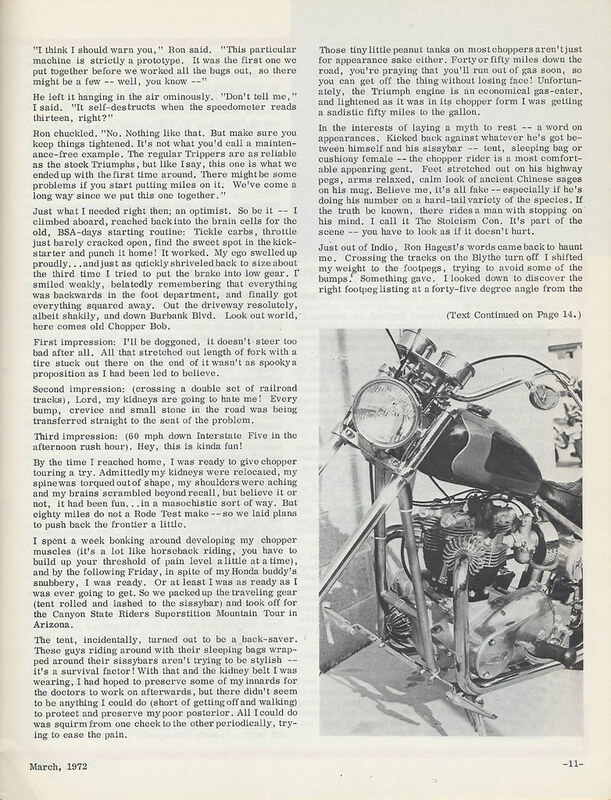 I have the Triumph choppers guide book that has the shop in it ,they were also makeing cafe racers too! 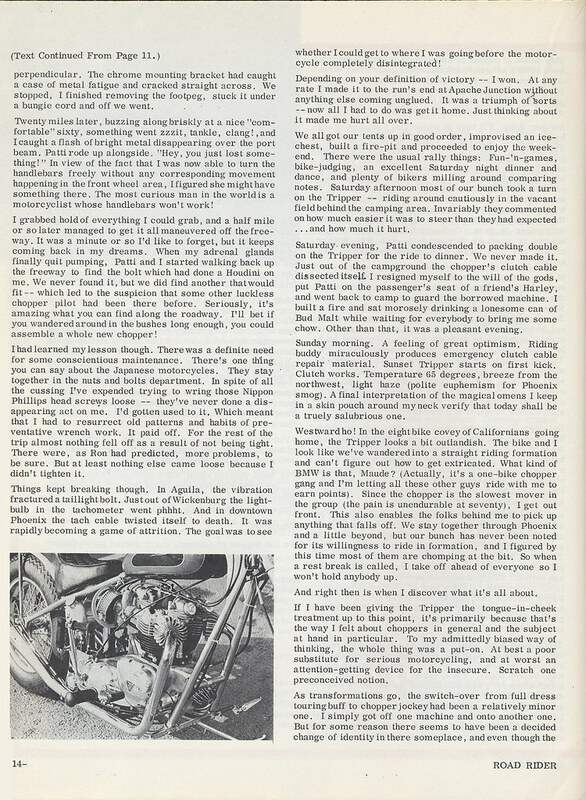 It's cool see old articles about my dad's bike shop. He said they built almost 1500 production bikes. Now a days Dad is retired and enjoying building stuff in the garage. He sometime comes out and checks out my business, Low and Mean. If anyone comes across a Sunset Tripper for sale please contact me as I have been looking for one of these bike for awhile. Interesting the bike looks really cool as photographed in the bike only pics, but riding pictures either don't do the bike justice or ?? It looks like a bolted on kit in those pictures. I really can't rectify the difference. I'd like to see it in real life. Reminds you how little things have really changed after all those years. Read through this killin time at work, cool read, the feeling of being alienated amongst groups with a pretty similar passion was interesting. If anyone is interested, we re-created the original 1970 Sunset Tripper shirt from Burbank choppers. Same art work and design from the 70's. Back then it was iron on, today we screen print. Shirts will sell for $17 on a limited production run. Check out http://www.lowandmean.com next week and we will have them up on our website. Email us at Sales@lowandmean.com if your interested. Tee is up on the website, let me know what your think and check out the video.